Access Control Bay Area will provide you the best security access control system for your home security needs. Too many people don’t consider Home Security until after they’ve been victimized by a burglary or other calamity in their home. However, a great deal of these incidents may have been prevented by having a Home security system. According to recent FBI statistics, more than two million home burglaries occurred in a year. This amounts to a home in the U.S. being broken into about every 15 seconds! As the economy and unemployment continue to place more people into a financially desperate situation, and a variety of other reasons for burglaries persist, this number isn’t likely to decrease anytime soon. Fortunately, there are many ways to minimize the likelihood of being a victim – and owning a security system tops the list. There are many other benefits associated with having a security system as the following list points out. A crook would likely find a different target if you have a home security system. Burglars typically target their victims based on ease of entry, among other things, but the likelihood of getting caught certainly plays a role. When a security system exists, they are more likely to move on and find a less risky target. The peace of mind that comes from knowing your family is safe is priceless. Whether it’s the middle of the day when the kids come home from school, or the middle of the night when you’re all asleep, knowing that you have the protection of a security system will mean a lot. Every major insurance company will give a discount on the premium for a homeowner’s policy when there is a security system installed. The typical savings are in the 10 to 20% range and will help to offset the cost of buying a system and/or monthly service fees. Have you ever been away on vacation and worried about your home? I can tell you firsthand that there’s great peace of mind in knowing your home is protected while you relax in the sun. In addition to possibly preventing a break-in or notifying police should there be one, many security systems will also monitor your home for water, fire, smoke and carbon monoxide which gives extra assurance that all is well at home. With a security system monitoring your home, a break-in or other event can minimize loss and damage as appropriate assistance (police, fire department, plumber, etc.) can be notified immediately. Many security systems provide the means through the system itself or a monitoring service, that will bring help sooner rather than later. That’s right – having a home security system will add value to your home. When selling a home, a security system would be included in the listing which can give you an edge compared to similar properties. If the system is easily removable as some are, it can also be used as a bargaining chip to close the deal or maintain a price point. In addition, would-be buyers place value on the security that their family would enjoy immediately after they buy their new home. Protect yourself from more than just a thief. Most security systems on the market today either include or give the options of integrating fire, water, smoke and carbon monoxide detection as part of the system. If a fire should start or a washing machine hose should break, you and/or authorities would be notified immediately and damage would be minimized. Watch your home from anywhere. Technology today has come a long way, including what the internet can be used for. Many home security systems offer video surveillance of wherever you have a camera installed in your home. This certainly has many uses including baby or nanny monitoring in addition to just seeing who’s lurking around or inside your home. There are basic video monitoring systems available for as little as $100. Cut back on energy costs. Like sensors for water and smoke detection, many home security systems available today allow the control of thermostats, lighting and other electrical devices. This can lead to savings in heating and electrical expenses. 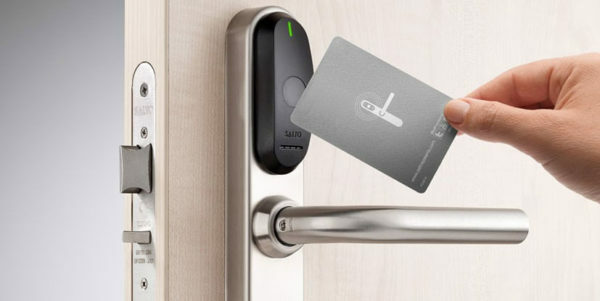 It’s possible with the technology available today to control and monitor your front door from your smart phone or any internet connected device. Imagine knowing every time your front door was opened and who opened it. Whether it’s a cleaning service, a repairman or just the kids coming home from school, there are lock-sets that will notify you with every opening of the door. You can even let people in remotely or lock the door behind the kids once they’re safely inside. There are a variety of home automation technologies that are available as part of a home security system.